Flat feet are a part of childhood, as this is a common foot shape during early development and growth. Medically significant flat feet develop after the initiation of a heel-to-toe walking pattern, usually sometime after age 5, as the toddler ‘floppy feet’ disappear. Flat feet beyond this in and of itself is not a true deformity, as it is a normal variant of human foot shape. However, the presence of flat feet can lead to additional issues. One of the most common direct symptoms associated with flat feet is arch fatigue with extended activity, as well as pain in the front of the leg at night from muscular overuse. Other related pain can also occur due to strain in other parts of the foot from the flattening. For example, strain to the inner side of the foot near the ankle from can result in a type of tendon inflammation, and this can also be compounded by the presence of an extra bone commonly found in some people on this side of the foot. Strain of a ligament in the arch called the plantar fascia, commonly seen in adults, can develop in children as well, although less commonly. 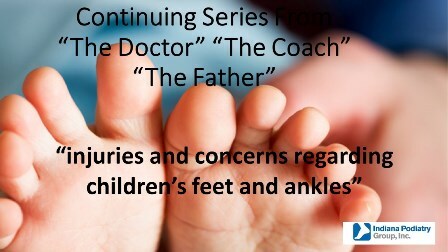 Most cases of flat feet in children are flexible, meaning that the deformity can be corrected with arch support. This is an important consideration, because treatment options highly depend upon this flexibility. Most cases of flexible flat feet respond very well to early initiation of orthotic shoe inserts to provide arch support. For many children, these inserts eliminate the fatigue of flat feet when combined with supportive shoes, and can also slow down the progression of deformities associated with flat feet (see the section below on early foot deformity). Orthotics, like prescription eyewear, cannot reverse or correct the actual deformity, but can improve the quality of a child’s activity. It should be known that most inserts bought in pharmacies, shoe stores, and even self-described ‘orthotic’ stores do not convey adequate support to the arch to be of much long-term help, as they are often too compressible and soft or, in the case of an ‘orthotic’ store’s products, more rigid but poorly fitting due to mass production sizing. Some children with flexible deformities do not respond to orthotic therapy. For those children, there are a myriad of choices available for surgical correction, including procedures to limit the flattening, as well as bone and ligament/tendon reconstructive procedures. Some of these procedures do not require completion of bone growth, while others do. Rigid cases of flat feet, in which the foot cannot be physically placed back into a more normal position, generally do not respond at all to orthotic therapy, as there is little to no motion to control. These cases typically require surgical reconstruction. There are special cases of flat foot deformities that are typically discovered at birth or shortly thereafter. These include conditions that have severe genetic deformities. Correction involves very early specialized intervention that may include manipulation and weekly casting, and sometimes surgical correction. In general, it is best that concerns for flat feet be referred to a podiatrist for full assessment of the deformity, and any treatment options the deformity requires.